Whether visiting Albuquerque on vacation, just passing through or you're a local who wants a souvenir from time to time, there is an Albuquerque souvenir for you. You'll find collectibles such as Isotopes t-shirts, Breaking Bad candy and inexpensive trinkets, depending on where you look. 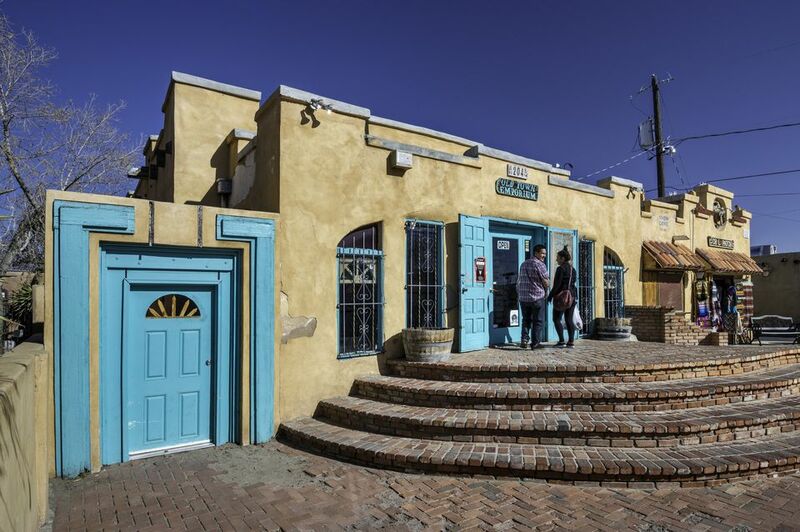 These shops around town will carry something to take home that screams "Albuquerque." Old Town has many shops where you can purchase souvenirs. The Covered Wagon has a wide range of Albuquerque souvenirs, from Rt. 66 memorabilia to toys for kids. There are Minnetonka moccasins, Pendleton blankets, leather goods, Indian jewelry, pottery, painted ponies, t-shirts, key chains, shot glasses, and more. The Old Town Basket Shop carries similar items, and in the back, you'll find a treasure trove of hats, pop guns and toys for the kids. In the front of the shop, you'll find souvenirs that include chile pepper aprons and pot holders, dip mixes and other food products. The Old Town T-Shirt Co. has a large selection of t-shirts, sweatshirts, jackets, and hats. Wild West T's and Gifts has jewelry, t-shirts, gifts, and souvenirs. And the Old Town Emporium carries Kachinas, Christmas ornaments, candles, Rt. 66 items, t-shirts, and gifts. The Candy Lady provides many chocolates and candies, but Breaking Bad fans can find her blue crystal candy that has been popular with those who love the show. Visit the Isotopes store at Isotopes Stadium for hats, t-shirts, bobbleheads and more. The store is the place for fans of Albuquerque's baseball team to pick up an Isotopes baseball, mugs, cups, water bottles, picture frames, and magnets. Kids can get an Orbit plush doll or a plush red chile. Whether you're a fan of Lobo baseball, basketball, football or other sports, there's a Lobo t-shirt or hat for you to show your Lobo pride. The store carries ties, pants, shorts, polos and other apparel with Lobo designs. Other items include cups, tumblers and drinkware, stickers and decals and accessories for the car. Spirit items include a Lobo gas grill cover, flags and pom poms for showing spirit at games. The New Mexico Look has everything New Mexico, from Lobos gear to Duke City hats and t-shirts to items depicting the Balloon Fiesta, Gildan New Mexico Bowl, Albuquerque Isotopes, NM State Aggies, Highlands University and even the Rail Runner. New Mexico Look has a large selection of New Mexico souvenirs and team apparel. Rio Grande Trading has a large selection of Native American pottery and jewelry as well as Pendleton blankets, Navajo rugs, sand paintings and smaller souvenir items. The store is across the street from Duran's Central Pharmacy, a popular destination for locals as well as tourists. Skip Maisel's is in downtown Albuquerque, just across the street from the KiMo Theatre. The art deco style of the KiMo is seen in Maisel's, as well of elements of the Route 66 heyday. Maisel's is well known for having a large selection of Indian jewelry, and the prices are wholesale rather than retail. You'll always find a great deal at Maisel's. Besides jewelry, there are other southwestern items to include rugs, pottery, dream catchers, gifts for kids, sand paintings and Kachinas. Several Indian craftsmen work in the store, and you can watch as you browse the rugs, pots and many items for sale.